Then there was the father who launched into a story for his young daughter, about a mulberry tree in the backyard of his childhood brownstone. “Know what I used to do? I’d put a blanket down on the grass and just shake the branches so they’d fall down, and pretty soon I had a whole bucket full. They’re really good on ice cream.” After pulling down a few branches to show her how to pick the sweetest, deepest purple berries, she was a pro, with an armful ready to take home to mom. The odds of her berries getting home intact were probably low; the odds of her arriving home with purple-stained hands and clothes high. But we shared a few berries and enthused at dad’s idea for ice cream, while I shared with him an improvised recipe for mulberry sauce from last summer’s farm-to-table road trip. My mulberries? Some made it into a similar sauce, for pork tenderloin (heating berries in the pan drippings with some water, sugar and fresh thyme, reducing it down to a liquid consistency). A few others were muddled into a couple of variations on mulberry-gin cocktails. More on that later. In the meantime, here’s to the joys of urban foraging, from the wild raspberry bushes along the Hudson River to the herbs, greens. and even sassafras root (a basis for root beer) from nearby Prospect Park. Do not be afraid, city dwellers: the worst food -borne illness I’ve ever experienced came from strawberries purchased at the local Safeway. Well, my park is positively blue with mulberries. I’ve taken a few quarts out already. I noticed this weekend that 2 women brought a tarp to shake the branches (the best way to do it… especially since the trees are 50′ tall!). I love them.. they make a great sauce and awesome ice cream! 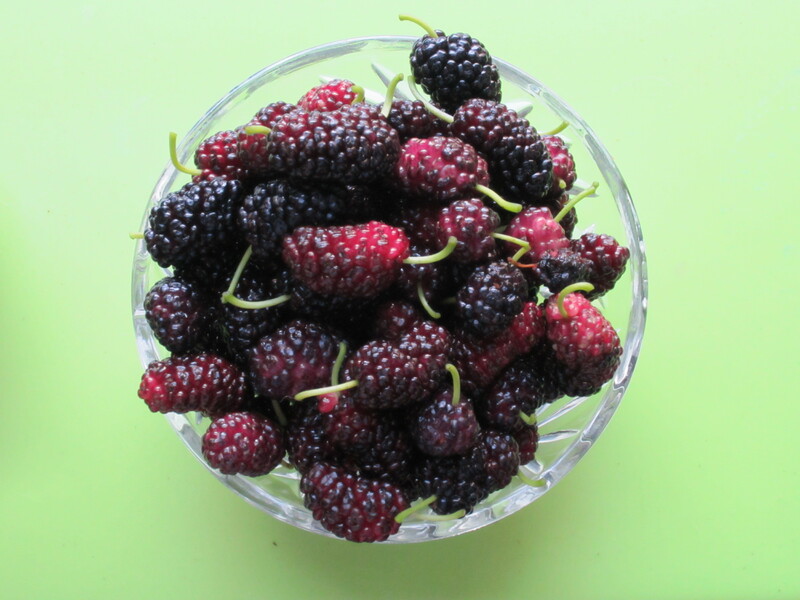 So now we have plenty of mulberries and besides just eating them plain (as my husband and daughter do), I have to think about how to incorporate them into baking! I wasn’t sure what to do as I had never eaten a mulberry before. I had a few suggestions from friends – a mulberry pie, or mulberry jam, or mulberry ice cream, or mulberry sorbet, but I was thinking about tarts. Despite all my excitement, there actually aren’t all that many mulberry trees around New York today, which makes finding a good one all the more satisfying. According to the Parks Department, just 1,200 of New York City’s 600,000 street trees are mulberries. Walking home from the subway this evening, I caught sight of a father and daughter at the mulberry tree, with dad in his suit jumping up to reach the ripest fruit on the higher branches, with daughter waiting to grab the bounty. I had to wonder if it was the same pair I encountered a year ago. But at any rate, I grabbed a couple of the darkest berries, which have gotten to their point of sweetness as the crop has peaked and though it worth reprising this former trip to Mulberry Street.